Who are the Dialysis Specialists at Wil-Med Global? Wil-Med Global Inc. has been providing equipment to many of the largest renal care providers in the world for over 25 years. Our history of quality, and experience prove our reconditioning process is second to none. Wil-Med employs only Factory Certified Technicians; and use only OEM Parts in our reconditioning process. Each reconditioned machine is shipped with its own documentation including a work order, detailing all work that has been performed on each machine during its reconditioning process. 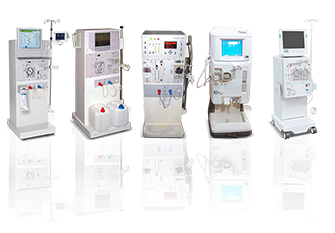 The pool of dialysis machines available through Wil-Med Global, Inc. is, in a word, enormous. Better connections mean a better source and quality of pre-owned equipment to start the reconditioning process. The end result, machines that exceed expectations of performance and appearance, at a fraction the cost of new. Our 24-hour technical assistance, and award-winning customer service and you will see that equipment from Wil-Med Global, Inc. is not only a smart decision for your patients, but for your peace of mind as well. Trust the Dialysis Specialists. Trust Wil-Med Global, Inc. Anyone who has ever done business with us knows our priority is patient care and customer satisfaction. Discover the Wil-Med Global, Inc. difference for yourself. Call us for a complete catalog, or simply let us know your needs. You have our word that when it comes to reconditioned dialysis equipment, no one will deliver better quality for less.